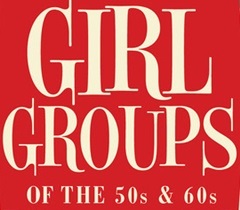 Now that I’m done looking back on my teenage soundtrack, it’s a return to female singers today, but this time I’m featuring girl groups of the 50s and 60s. lollipop, lollipop kaboom boom boom, don’t say nothin bad about my baby. Now he calls me about three times a day, my heart stood still, yeah his name was Bill, da do ron-ron-ron. My boyfriends back and your gonna be sorry you were ever born. Here comes my big boy walking down the street, so tell me now and I won’t ask again, will you still love me tomorrow. Hey Mr Postman look and see, is there a letter for me. Whenever you are near I hear a symphony, a thousand violins fill the air now. It’s a matter of time, I will make him mine if it takes me forever. I have been waiting for you, so wont you be my baby now. Been gone most of the day, so just getting to check them out…thanks for the “Girls Day”. Nancy, thanks for listening. 🙂 I was busy myself today so there will be no medley tomorrow. Thanks for more great moments Ray on a Saturday morning! Great tunes as always.